With confessed murderers going free and the recusal of an entire District Attorney’s Office, you might be asking yourself what’s going on in Orange County? Among the many alleged violations, a secret record keeping system called TRED, deputies committing perjury, and the failure to present exculpatory evidence for criminal defendants are at the center of a controversy involving the use of jailhouse informants. It might surprise you that the key witnesses for many prosecutions in California are convicted felons already behind bars. 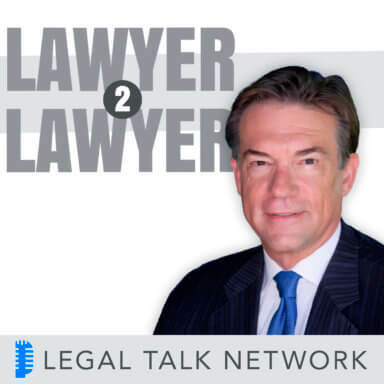 In this episode of Lawyer 2 Lawyer, producer Laurence Colletti interviews Professor Alexandra Natapoff from Loyola Law School, Los Angeles and Rudolph Loewenstein, a recommendation directly from the Orange County Public Defenders Office. Together they discuss the constitutionality of Orange County’s Jailhouse Informant Program, why there’s such uproar in its use, and why Texas might be turning away from such practices in death penalty cases. Tune in to hear about the “papering” of Judge Thomas M. Goethals and likely punishments for alleged abuses of the system. Professor Alexandra Natapoff is associate dean for research, professor of law, and Rains Senior Research Fellow from Loyola Law School, Los Angeles. She is an award-winning legal scholar and a nationally recognized expert on criminal informants. As author of ‘Snitching: Criminal Informants and the Erosion of American Justice’, she won the 2010 ABA Silver Gavel Award. Natapoff has testified before the U.S. Congress and assisted numerous jurisdictions in drafting informant-related legislation. Mr. Rudolph Loewenstein was recommended to us by Mr. Scott Sanders of the Orange County Public Defenders Office. He is a certified criminal law specialist who has been practicing in that area for over 30 years and is admitted to the United States District Court and the United States Supreme Court. Lowenstein is a former deputy district attorney who is now defending clients in the very types of cases he used to prosecute. Advertiser: We are far past the point of wondering whether these allegations are true against the district attorney’s office. The judge refused the entire office because of the demonstrated perjury committed by officers and district attorneys. Judge Goethals, who is known to be an excellent judge, is fair, is impartial, and when he found that those individuals had been committed perjury in his courtroom, I think that he had had enough. Laurence Colletti: Hello and welcome to Lawyer 2 Lawyer. This is Laurence Colletti coming to you from Legal Talk Network headquarters in Denver, Colorado. I am the producer, and Bob and Craig are not able to join us today because of work conflict, but since I’m also an attorney, I will carry on their tradition. Before we introduce today’s topic, we’d like to thank our sponsor, Clio, an online practice management for lawyers at www.GoClio.com. In recent news, there’s been media coverage of a jailhouse informant program in Orange County involving both the sheriff’s department and the district attorney’s office. Challengers of the program claim that it has resulted in constitutional violations and the withholding of exculpatory evidence. In one case, it is alleged that an innocent man was put to death for a murder he did not commit. To further stoke the fires of debate, convicted murderers are being released without life sentences and an entire DA’s office was recused from a murder trial with a confessed mass killer. Given that the allegations of wrong-doing date back to the 1980’s, the potential impact on lives in the region could be immense. Here to discuss this issue, we have two guests. The first is associate dean for research, professor of law, and Rains Senior Research Fellow, Alexandra Natapoff from Loyola Law School, Los Angeles. She is an award-winning legal scholar and a nationally recognized expert on criminal informants. She is the author of ‘Snitching: Criminal Informants and the Erosion of American Justice’, which won the 2010 ABA Silver Gavel Award. She has testified before the U.S. Congress and assisted numerous jurisdictions in drafting informant-related legislation. Welcome, Professor Natapoff. Alexandra Natapoff: Thanks so much for having me. Laurence Colletti: And next we have Mr. Rudolph Loewenstein, who comes to us by recommendation from the Orange County Public Defenders Office. Mr. Rudolph is a certified criminal law specialist who has been practicing in that area for over 30 years and is admitted to the United States District Court , as well as the United States Supreme Court. He is a former deputy district attorney who is now defending clients in the very types of cases he used to prosecute. Welcome, Mr. Loewenstein. Rudolph Loewenstein: Thank you very much. Laurence Colletti: Well, before we get started, I want to mention that we reached out to the Orange County Sheriff’s Department, district attorney’s office and the public defender’s office and we were politely turned down by all of them. But we did receive a recommendation for Mr. Loewenstein personally from assistant public defender Scott Sanders who’s at the center of this controversy. So we wish to thank him and re-extend our invitation to the public defender’s office as well as the district attorney’s office and sheriff’s department. When the timing is right, we certainly wish to talk to all of you. So my first question is for both of you and it’s just for our listeners to get a gage of your perspective on this issue. How do you feel about the use of jailhouse informants in general? Professor Natapoff, let’s start with you. Alexandra Natapoff: So as I think this case illustrates for everyone, the use of jailhouse informants is a crucial public policy about which the American public knows very little and yet has a huge influence on our criminal justice system. Criminal informants generally are a massive part of the way American law does justice, it’s the way we make cases and run investigations, it’s the way we gain evidence, and first and foremost, most importantly, it’s the way we make deals. It’s the way we make deals with suspects and potential offenders. And it really touches every aspect of the criminal justice system. Jailhouse informants are a particular kind of criminal informant, they happen to be incarcerated when they offer up evidence to the government or are sent in to gather evidence by the government about other targets. But they’re part of this larger phenomenon that you really can’t understand the American criminal justice system without taking a hard look at the way we use criminal informants. So jailhouse informants are enormously important. They’re obviously an extraordinarily risky way of managing cases and gathering information. And in an ironic way, we’re lucky that this debacle in Orange County has forced the country to take a harder look at them. Rudolph Loewenstein: Thank you, and I want to thank Scott Sanders for recommending me for this. What’s happened in Orange County is that through Scott’s efforts and the public defender’s office, he has spent the last approximately two years really researching this issue. He represents a gentleman by the name of Dekraai who is accused of being the largest mass murderer in Orange County’s history. And use of the jailhouse informant, as set up by the law enforcement in Orange County with the use of a recording device is what set all this in motion. And with regard to the specific question about why did prosecutors utilize these jailhouse informants, is that prosecutors never have enough evidence and they like to use jailhouse informants because they don’t have enough evidence to convict without it. Usually, in my experience, it’s not the icing on the cake of a strong case, it’s basically where they have weak cases and they’re trying to defeat a particular defense. These things involve confessions from defendants who are housed in the same area within the jail, and they’re inherently unreliable. But the prosecutor’s use them anyway because they’re trying to gain enough evidence usually to secure that conviction and to make sure they win. Laurence Colletti: Well, Professor Natapoff, the messiah of the United States case establishes that government agencies and their informants can’t question charged defendants who have legal representation. So I was wondering if you could walk through the logic of that case and then give us both an example of legitimate and illegitimate jailhouse informant. Alexandra Natapoff: Sure. So let me preference my answer, I’ll get to it in a minute. Just because something is technically legal in our criminal justice system doesn’t mean it’s a good idea. And to date, we have barely regulated the use of criminal informants and jailhouse informants in particular. By which I mean the Supreme Court has given police and prosecutors live birth to use and reward informants. States have a gannet to relatively, recently, essentially take in a hands off position, left it to the discretion of police and prosecutors. So it turns out that the law in this arena is actually quite thin, and that’s changing in states across the country, states are starting to consider more rigorous regulation of this risky practice. but the law that we currently have, as you know part of it is embodied in the messiah case. And the messiah case holds, essentially, but once a person has been charged with a crime, they have a right to counsel. So you can’t secretly interrogate them and you can’t secretly interrogate them in effect but using an informant. So the rule that that generates is that the government can not – in a standard of that case – deliberately elicit information from a defendant who has been charged, never has the right to counsel, by sticking an informant in their cell or putting a cooperator to come to visit them in their house or their car. The government can’t sneak around the right to counsel by using an informant. And in the Orange County case that we saw, the government sloughed that rule. They sent informants in and around charged defendants, meaning defendants who had the right to counsel, in effect to extract information and get information from them and secretly interrogate them by using informants. You should know that Orange County is not alone in this violation. Jurisdictions around the country have been found to violate this very important and particular rule. Los Angeles was a particularly egregious violator in a debacle about 20 years ago. So messiah gives defendants who haven’t been charged with crimes protections against jailhouse snitches. If you have not yet been charged with a crime, the Supreme Court holds that you don’t have the same kinds of protections against the informants because you don’t have a counsel and therefore, in the eyes of the law, essentially you’re on your own. And so for defendants who have not been charged, it’s not unconstitutional for the government to send an informant into the cell for example, to ask questions. As long as the defendant does not feel coerced or threatened or pressured in some way that might trigger, for example, the kind of concerns that we have in the Miranda case about a coerced confession. So constitutional law does not provide much protection to the vast majority of defendants who have not been charged yet with a crime and therefore their messiah 6th amendment rights have not kicked in. And that’s why I say to be a little bit careful about asking what the law is and forgetting to ask what should the law be or how should we be handling this very risky practice of sending in sensitized criminals in to extract information. And again, many states have started to consider stronger rules to protect defendants against informants, whether or not those defendants have been charged with a crime. Precisely because the threat of wrongful conviction and fabricated evidence is so strong, whether or not the defendant actually has a right to counsel and whether they’ve been charged. Laurence Colletti: Well I think that’s a good segway into my next question. Mr. Loewenstein, if these allegations against Orange County Sheriff’s Department and the district attorney’s office turn out to be true, what specific rights of defendants have been violated? So I know there’s some constitutional elements there but let’s get into brasstacks and specifics. Rudolph Loewenstein: Sure, and one thing I would add to the professor’s statement is it’s okay to be a listening post. So in Orange County, what they were doing specifically was they were putting represented defendants in a jail cell and then they were specifically targeting these defendants by using known jailhouse snitches and known informants. And they were putting them in there not to be a mere listening post, in other words, just sit there and if the guy wants to confess to you on his own with no prompting no interrogation, well then, that is not a violation of messiah and his constitutional rights to counsel. However, what they were doing was they were putting a known informant into a cell or module, inside the jail, with specific instructions to interrogate the defendant in an effort to get confessions and to obtain information would then be used at trial. And that is clearly a violation of messiah, it’s a clear violation of his 6th amendment right to counsel, and then, furthermore, what happened was that they were hiding this conduct and violating Maryland v. Brady and the rights to discovery and portraying this individuals as being incidental context. It’s just a coincidence that this informant happened to be placed in the jail cell, just coincidence that they happened to be talking about the defendant’s case. And coincidentally the only reason the informant came forward was because he was outraged by the conduct, and that was kind of the mantra that they were given. Essentially, I think it was a skrewt they were given in order to obtain these statements. And then when this plan insertion was hidden and notes were hidden that were kept by the snitch, then you’re in a position where your right to exculpatory evidence, your right to due process, your right to a fair trial law are all being violated and those are the allegations and I think many of them have proven out in Orange County. Laurence Colletti: Professor Natapoff, one of the features of these stories in Orange County is this system, it’s a secret records keeping system, or that’s what’s alleged. It’s called TRED, and so I was wondering if you could share with our audience what is that, should we worry about it and if so, why? Alexandra Natapoff: So there are two pieces to the TRED puzzle and let me just back up for a second and reinforce something that Mr. Loewenstein said. We are far past the point of wondering whether these allegations are true against the district attorney’s office. The judge recused the entire office because of the demonstrated perjury committed by officers and district attorneys. Dean Erwin Chemerinsky has called for a federal investigation. There were secured secret tapes of informants talking to sheriffs, deputies, and negotiation deals which are all on the public record now. So one of the important things about this example is that we actually know what happened. We know that law enforcement officials are willing to lie under oath, to a court, to defense attorneys. We know the extent of the coverup that the officers were willing to go through. So this happens all over the country, unfortunately, but it’s rare that we get such an in-depth glimpse of what actually happened and we need to credit Mr. Sanders, Scott Sanders, who is the public defender on this case for tirelessly going after this information, which is extraordinarily difficult to get. The government threw up enormous roadblocks against anybody finding this out. So we’re in the exposay part of this story already. We’re learning what actually happened. And TRED is just part of that story. At the beginning of the case, sheriffs, deputies, and district attorneys stated under oath at the stand that there were no records of these informants. The reason – as Mr. Loewenstein pointed out – the reason that’s an important question is because if there were records of these informants, the government would be constitutionally obligated to turn them over under Brady v. Maryland. The government claimed we didn’t keep records, therefore we didn’t have to turn them over. Turns out, the sheriff’s department was maintaining this – as you called it – a secret system of records called TRED, in which they were keeping track of their informants and their extense of use in the jail. And so one piece that the TRED system revealed is just how the culture of secrecy surrounding informants worked. The law enforcement either doesn’t keep records at all – it’s happened in many jurisdictions – or if they do keep records, they keep them secretly. The sheriffs and deputies said it was more important to keep the records secret than it was to comply with the constitution. And the second is the willingness of these law enforcement agencies to violate the law, to protect this culture of secrecy. Not once, not twice, and it wasn’t one bad apple, it wasn’t one mistake, but over and over again. Essentially, it’s office policy. Laurence Colletti: Well that looks like a great place to take a quick break. Before we move on to our next segment, we’re going to hear a message from our sponsor. Laurence Colletti: Welcome back to Lawyer 2 Lawyer, I’m Laurence Colletti and with me today are Professor Alexandra Natapoff and Mr. Rudolph Loewenstein and we’re continuing our discussion about Orange County’s jailhouse informant program. But before we get started on this segment, I wanted to get both of your opinions about this new Texas bill that would end the use of jailhouse informant on death penalty cases. So last time we started with Professor Natapoff. This time, Mr. Loewenstein, we’ll start with you. Rudolph Loewenstein: The interesting thing about the bill is that it recognizes the inherent unreliability of these jailhouse informants on the fact that they’re powerfully driven to say whatever it takes to reap the reward we’re looking for. And that, usually, is freedom or some kind of leniency. The thing I found odd about it is that it specifically applies only to death penalty cases and requires that testimony from jailhouse informants be excluded from evidence unless they’re tape recorded and I’m a little mystified as to how they’re going to be able to get tape recorded statements from jailhouse informants and defendants unless the prosecutors are involved and then how they get past messiah and the rights to due process. The defendants, I’m not sure, but if it passes and it does become law, it certainly is a step in the right direction. But I’d like to see jailhouse informants banned in all cases because of their inherent unreliability. I don’t know why it wouldn’t take effect immediately, it’s slated to potentially take effect in September of this year. So yeah, I’m all in favor of that. Alexandra Natapoff: The text still is really important. It would ban the use of any compensated witness, which is really what an informant is, it’s a witness who is trying to work off their own liability or shorten their own sentence or get a benefit in exchange for information, and it would ban the use of such informants in death penalty cases. Texas is actually passed a number of use of informant legislation. They have cooperation requirements for jailhouse snitches already, they have cooperation requirements for drug snitches in part because there have been so many informant debacles in Texas in wrongful convictions and mass arrest based on bad evidence that the issue has really come to a head there. I want to second Mr. Loewenstein’s point that there’s no inherent difference in their reliability between an informant and a death penalty case and an informant and any other kind of case. They’re all, in fact, compensated witnesses, they’re working for a benefit with massive incentives to fabricate. And because American law regulates them so lightly – and we converse such broad discretion on police and prosecutors to use them – they continue to be very risky witnesses in any kind of case. There’s a history, however, in American justice reform to start with death penalty cases. So the court has told us so many times, death is different. These are our most serious cases, they pose the greatest moral challenge and of course, if we get it wrong, the tragedies are so profound and irreversible. So I agree with Mr. Loewenstein, this is an excellent first step. We should have restrictions and restraints and controls on informants in all kinds of cases. But it’s appropriate that in death cases, where we really shouldn’t take these kinds of risks at all, that we shouldn’t use compensated criminal witnesses in case of the reflection of how seriously we take the capital process. Laurence Colletti: Okay. Well this next question is also for both of you, so this is something that rang out my research pretty serious and obviously got our attention. But recently, the Superior Court Judge, Thomas. M. Goethals, recused the entire Orange County district attorney’s office from a mass murder case. And what I wanted to do is have one of you walk us through that and both comment on why this is significant. So I think this is a good question for Mr. Loewenstein. Rudolph Loewenstein: As to why Judge Goethals recused the entire district attorney’s office, it’s because he found that there was a systematic misuse of informants within the Orange County jail system that the Orange County Sheriff’s Department had a working arrangement with local law enforcement and including on their own, where they were systematically – and without disclosing it to the defense for years – violating defendant’s rights under Brady v. Maryland and then by refusing to tell anybody about this because it was secret. And then massive violations of messiah and then when told to account by Scott Sanders, the ironic thing is that the DA’s office representatives called his allegations scurrilous, which is an odd term. But imputing Mr. Sander’s character and then it turned out that in fact, upon further review and analysis, he was exactly right. And under the Orange County District Attorney’s watch, they’re the top law enforcement agency in Orange County. They’re responsible for the actions of all these associated law enforcement agencies, including their own deputies. And their own deputies and involved especially in the gang unit and then in the capital homicide unit, apparently new. And I say apparently because I wasn’t in the courtroom. But Judge Goethals found that they lied under oath. And in fact, he found them not to be credible and called them the task force and decided that there was no way that the Orange County DA’s office could be then impartial when their own deputies are being found to have lied under oath when questioned about the withholding of evidence in this area. So what he did was he said the entire office is recused because I can not find that the defendant in the Dekraai case is going to get a fair trial from these defendants. And they’re appealing it and the attorney general is investigating the Orange County DA’s office, but they’re appealing it on behalf of the DA. So it’s kind of ironic that the fox is watching the henhouse here, but it’s Judge Goethals, who is known to be an excellent judge, who I have known since we were both in the DA’s office together here in Orange County, is fair and impartial and when he found that those individuals had been committing perjury in his courtroom, I think he had enough. He had seen enough and he recused the entire office. Laurence Colletti: Professor Natapoff, I wanted to just this follow up a little bit for you and I wanted to tape in obviously to your legal mind. But also just you as a citizen, as somebody that goes to work every day, when you see a district attorney’s office recused from a mass murder case and you think about the administration of criminal justice and the perceptions that we must all have that law is basically fair and it’s administered fairly, what do you think something like this when it gets into the media does to the public? Alexandra Natapoff: I think that the informant phenomenon challenges a lot of our assumptions and conceptions about how justice is done. People are always shocked when they learn that law enforcement relies on paid criminals to get information in weak cases. They’re always shocked that law enforcement bends the rules of the truth to use witnesses like this. They’re always shocked that law enforcement sometimes turns a blind eye to the crimes of its own informants that continue to commit crimes or even very serious crimes that they have infamously done. So in many ways, the informant deal between the government and criminal suspects turns the justice system on its head, just kind of turns everything upside down. And this is a great and terrible example of it. Now we have law enforcement who have become the law breakers. They’re violating the Constitution, they’re lying to the judge, all to preserve this habit, this culture of secrecy, this way of using and manipulating evidence. And it’s another example of just how hard law enforcement has been willing to fight to keep this culture of secrecy alive. I think all across the country in state after state where citizens and legislators have seen these debacles when their sense of “safe” in police and prosecutors has been shaken when they see how those officers or individuals are actually making decisions. And we are seeing change, we are seeing law for new laws, for new restrictions, because people now understand that the justice system doesn’t work the way they thought it did. Laurence Colletti: Mr. Loewenstein, I want to talk about a practice called papering the judge. So section 170.6 of California’s Code of Civil Procedure allows lawyers to make peremptory challenges to disqualify a judge if they deem prejudicial against their interest. And so from the period of 2011 to 2013, the district attorney’s office did this six times. But more recently from February 2014 to today, it’s on record that they’ve done it 57 times. And so this is kind of a big deal, but I want to get your opinion. What’s causing the recent frequency of the peremptory challenges in the district attorney’s office to increase like this? Rudolph Loewenstein: I want to make it clear that this is specifically directed at Judge Goethal. The 57th time is very recent and since the judgement issued by Judge Goethals in his recusal ruling. So the 6th times previously in the years before just deals with – for some reason – the judge may have personal knowledge, the judge may have some issue a particular DA may realize that this judge isn’t a good judge in this case, so you pay for the judge. What the DA’s office is doing is what’s called a blanket paper. A blanket paper of a judge is where everybody who is assigned to Judge Goethals’ department is challenged him for cause and using their one time use of a disqualification to disqualify him. And it’s following the Dekraai ruling where e recused the DA’s office and he found that they were lying under oath. And the problem with it is is that they claim it’s a singular decision by the DA who is assigned to each case. That just defies credibility. It’s an effort to intimidate Judge Goethals, it’s an effort to intimidate the entire judiciary because what they’re doing is they’re putting Judge Goethals out of business for hearing criminal cases and they have that power. And when they exercise it in this way, it undermines the fairness in the system that I think the professor was talking about. It causes a loss of confidence in the fairness of the system, because the DA is telling Judge Goethals and telling every other judge on the bench that if you rule against us and if we don’t like you’re ruling ,we’re coming after you and we’ll put you out of business. And it’s a clear form of intimidation and it forces the judges to see if they have the moral purge to stand up to the DA or if they’re going to follow their conscience in their rulings when they hear these cases and follow the facts and the law. And if they rule against the DA, they shouldn’t be in a position where they’re under the threat of the DA’s office filing a blanket paper against them, and that’s exactly what’s happening to Judge Goethals and it really shouldn’t be tolerated by the judge. All the judges should stand up against it and the public, it’s wrong. Laurence Colletti: Professor Natapoff, the use of jailhouse informants has been credited to overturning trials and reducing sentences for self-confessed murderers. So I’m wondering for our audience, who may not understand how it’s possible for a self-confessed murderer to go through, can you walk us through why this happens? Alexandra Natapoff: Sure. It goes to the basic architecture of how we use informants. An informant is a suspect or a criminal defendant who makes a deal with the government in exchange for their giving information or cooperation, they get a benefit. Typically, the benefit is leniency for their own crime and I think we haven’t spent enough time really digging down into what this means. It means the government is saying to criminals, we’ll forgive you. We will drop your cases, we’ll let you walk. We’ll give you shorter sentences, we’ll sometimes turn a blind eye to crimes you continue to commit while you’re cooperating with us if you are sufficiently useful. And that’s really the heart of the informant challenge. It’s the risk of cutting these deals with defenders. The risk, of course, that we get, fabricated information because the temptation is so great when your own liberty is on the line to make stuff up. And the risk more generally to the integrity of the criminal justice system itself because instead of going after the bad guys, which is what our criminal justice system purports to do, it’s essentially cutting a deal. It’s creating a market for guilt and information that operates under the radar in a way that judges often have no idea about. The public has very little understand of and it’s what I meant before when I said that using informants kind of turns the system upside down. So as a result, we get very serious offenders who are permitted to walk away. Perhaps the most infamous are the mafia hitmen, James J. Bulger and Stephen Flemmi in Boston, but there have been many, many other very serious offenders who have committed murder, kidnapping, extortion, drug dealing, while they’re working for the government because they provided such useful information. And we’ve seen in this case in Orange County that because the government was not willing to meet its constitutional obligations to disclose information, dropped cases. It set people accused of murder -convicted of murder – free early. The government in Orange County preferred to let accused murderers walk than disclose its own informant information gathering practices, which is really right through the looking glass. Laurence Colletti: So Mr. Loewenstein, as these investigations go on that these alleged violations by Orange County district attorney’s office and the sheriff’s department are proven true, there’s been a long systematic abuse of constitutional rights, withholding of exculpatory evidence has also been reported. What possible punishments are there for those involved? So the police officers, the attorneys, all the people that work in conjunction with this, even some of the jailhouse informants, what kind of possible punishments could there be? Rudolph Loewenstein: Well there could be possible punishments for a wide ranging, but the historic reality of it is that there’s very little likelihood that anybody is going to suffer much in the way of punishment or sanction. Obviously you could have punishment for law enforcement, there would be prosecution for perjury, civil liability, loss of employment. So far we’ve had one sheriff’s deputy who’s refusing to testify and cooperate with the DA’s office and other prosecutions now because of his fear of being cross-examined on these issues and fear of being prosecuted for perjury. For the prosecutors involved, the question is do they still have a job and why do they still have a job. After being found to have committed perjury by the judge who has listened to their testimony and looked at the documents, how is it possible that they still have jobs? They can be sanctioned by the Bar. So far as far as I know, there’s been no sanction by the Bar. There’s been no findings by the Bar as a result of Judge Goethals’ ruling. It’s a misuse of power, the failure to disclose evidence, lying to the court. Yet as far as I can tell, none of the possible sanctions that have been widely circulated and frankly would be expected. If the defense attorney had done what these prosecutors have done, I’m sure there would have been a massive rush to sanction the lawyer, sanction the defense lawyer. But it’s a question of fairness and so far, nobody’s lost their job, nobody’s facing these civil liabilities, nobody’s in a position where they’ve been charged with perjury and no sanctions by the state Bar. But all those things are possible, but in my opinion, no one has yet been called to account for the lies and deceit perpetrated on the system and on these defendants. Laurence Colletti: Well, it looks like we’ve reached the end of our time for our program today, but I want to thank both of our guests for joining us today. And I also wanted to ask you to share some final thoughts as we get into the closing here. Professor Natapoff, let’s start with you. Alexandra Natapoff: Just that for people who are interested, there’s a huge amount of information, a fantastic reporting on this story, the Orange County register has done great work, Al Jazeera has done work, Slate did a piece the other day. Dean Erwin Chemerinsky has written about this. There’s just a huge amount of information. It’s a story that’s going national. The Washington Post, The New York Times has started to pick it up too. I think for those of you who are interested in seeing how this really works, I encourage you to take a deeper look, there’s a lot of wonderful material out there and I think it’s going to teach us a lot about how the jails department system works and it’s going to help us do better all across the country. Laurence Colletti: And if our listeners wanted to follow with you, Professor Natapoff, how could they reach you? Alexandra Natapoff: I run an educational website called snitching.org with information about this and similar cases. They can reach me through the website or through Loyola Law School Los Angeles. Laurence Colletti: Mr. Loewenstein, final thoughts? Rudolph Loewenstein: I’m hoping that what’s going in Orange County really does put a spotlight on this issue and hopefully it’ll lead to reform. And within my own practice here in Orange County, I’m hoping that the prosecution really has learned their lesson and I’m hoping there will be adjustments in the system and the use of these jailhouse informants will be banned and further restricted. And that’s my hope, we’ll see what happens. Laurence Colletti: And if our listeners want to get ahold of you? Rudolph Loewenstein: They can visit my website, it is RELCrimLaw.com, or they could email me at [email protected]. My office number is (714) 544-9844 if they really want to speak to me in depth about this. Thank you very much for having me though. Laurence Colletti: And that brings us to the end of our show. I’m Laurence Colletti, thank you for listening. Join us next time for another great legal topic. When you want legal, think Lawyer 2 Lawyer.